This three half-day programme of learning is designed to develop the skills, behaviours and capabilities of transformational leaders and change agents across the system. You'll learn through a number of experiential and practical activities and the facilitation approach will be underpinned by positive and humanistic psychology; strength focused and person-centred. Odie Mack has a background in systems practice and leadership coaching, and has been developing people so they can develop others for well over a decade. Most recently, she worked nationally as a Learning Lead for Addaction, a large charity which provides treatment relating to mental health, drugs and alcohol. 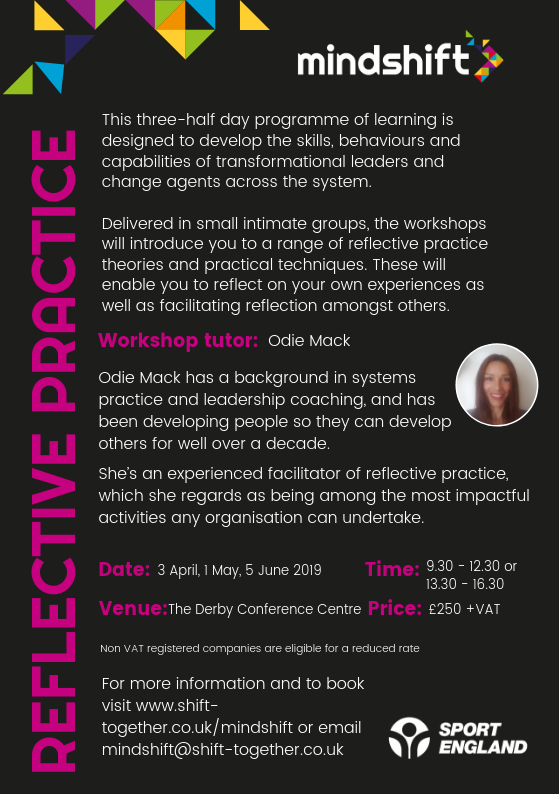 She's an experienced facilitator of reflective practice, which she regards as being among the most impactful activities any organisation can undertake. Odie advocates a mindful approach to learning and is most passionate about encouraging calm environments in which people feel comfortable to be themselves and can have meaningful, straightforward working relationships with others. Odie's work emphasises awareness of self, others and the wider social system which sees huge benefits to both organisations and personal wellbeing. It's her hope and intention this ultimately has a positive impact on wider society.